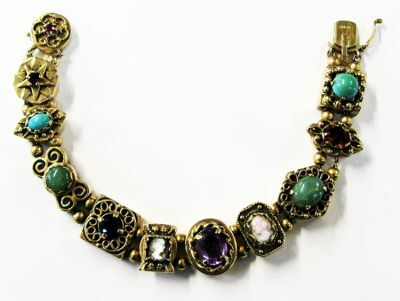 A beautiful vintage 14kt yellow gold slide bracelet, that is set with 1 round cut deep red ruby, est. 0.15ct; 2 round facetted cut dark red garnets, est. 1.27ct; 1 round cabochon medium green turquoise, est. 0.88ct; 1 round cabochon medium green chrysophrase, est. 2.36ct; 1 oval cabochon medium green chrysophrase, est. 2.20ct 1 round cabochon medium green turquoise, est. 1.82ct; 1 oval facetted medium purple amethyst, est. 2.00ct; 1 oval facetted medium brownish red garnet, est. 0.90ct; 1 mother-of-pearl cameo, approx 6.5 x 6.0mm and 1 pale pink coral cameo, approx. 8.0 x 6.0mm. It is approx. 7 inches (18.48cm) in length and has a safety clasp.